It wasn't too long ago - maybe just 10 years ago - that you might have to explain to someone (even many golfers) what an Arnold Palmer is. Not the golfer - the drink. But these day, the Arnold Palmer drink is darn near ubiquitous. It really started in the early 2000s when Palmer licensed his name and image to the Arizona Brewing Company, which then created a whole bunch of Arnold Palmer tea-and-lemonade mixes. Then there was a Sportscenter commercial featuring Palmer making the drink, and later still a short ESPN 30-for-30 documentary about the drink. How common is the Arnold Palmer today? So common that Dunkin' Donuts will serve you up a frozen one. They call it the Arnold Palmer Coolatta: "Iced tea and lemonade with a refreshing twist. Our Frozen Arnold Palmer Coolatta® is just the ticket to keeping you icy cool in the heat," the Double-D says. Have you tried one? It's basically a slush - frozen tea and frozen lemonade blended together in a 50-50 mix. If you want one, hurry - Dunkin' says it's a limited-time offer. 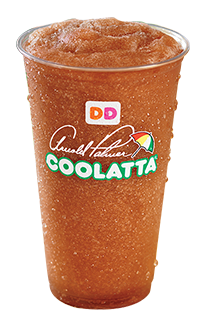 The Arnold Palmer Coolatta will probably be available only through Summer 2014, but if it proves popular, who knows.